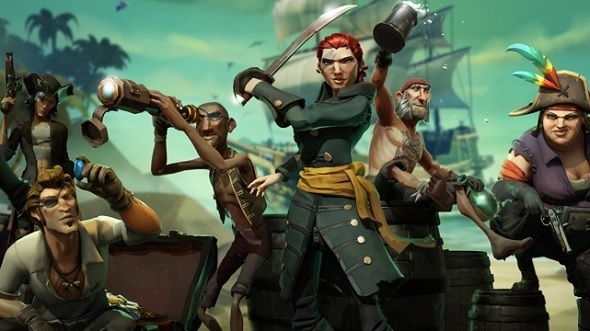 Sea of Thieves, which sets sail for PCs and Xbox One consoles Tuesday, is only the newest in a long line of pirate games – and in its achievements, it pays homage to the granddaddy of them all, The Secret of Monkey Island. To find out more, check out our extensive preview of Sea of Thieves. They’re a knowing nod to Secret of Monkey Island’s insult sword fighting system. Back in the day, Guybrush Threepwood, the star of the Monkey Island series, had to complement his sword-fighting skills with rapier wit. During the pauses in a fencing duel, a combatant would hurl an insult, forcing his opponent to respond in kind. The duellist with the most barbed insults or comebacks would end up gaining an advantage, and three successful put-downs could ensure victory. One such insult couplet was “You fight like a Dairy Farmer,” to which the correct response was “How appropriate! You fight like a cow.” The corresponding Sea of Thieves achievements, appropriately, appear to deal with swordplay. It’s a nice tip of the hat to Secret of Monkey Island, which came out in 1990. The second game in the series, Monkey Island 2: LeChuck’s Revenge, is on our list of the best adventure games of all time. You can check out the full achievements list here.